China will drive the majority of growth in the crude oil refining industry in Asia between 2018 and 2023, contributing 44% of Asia’s crude oil refining capacity in 2023, according to GlobalData, a leading data and analytics company. 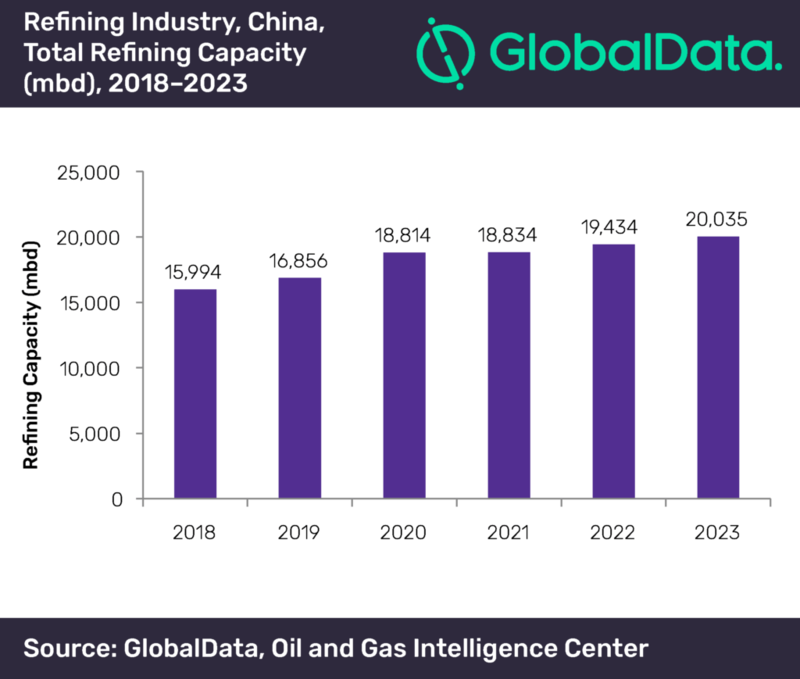 The company’s report: ‘China Crude Oil Refinery Outlook to 2023‘ reveals that the total refining capacity of China in 2018 was 15,994 thousand barrels per day (mbd), which was 46% of Asia’s total refining capacity in 2018. The country’s total refining capacity is forecast to increase at an average annual growth rate (AAGR) of 4.5% to 20,035 mbd in 2023. China’s planned and announced crude oil refining capacity is expected to increase from 460 mbd in 2018 to 3,721 mbd in 2023. The country’s total coking capacity, catalytic cracker capacity and the hydrocracking capacity is expected to increase during the outlook period. The total coking capacity is expected to increase from 1,991 mbd in 2018 to 2,371 mbd in 2023. China’s total catalytic cracker unit capacity is expected to increase from 4,359 mbd in 2018 to 5,532 mbd in 2023. Over the five year period, the hydrocracking unit capacity of the country is set to increase to 2,922 mbd from 1,846 mbd.